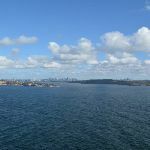 This walk provides some of the best views in Sydney. 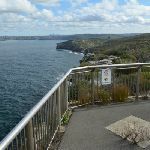 This pleasant stroll and wheelchair-accessible walk starts from the car park at the end of the North Head Scenic Drive, and follows the asphalt footpath as it loops around the tip of North Head. 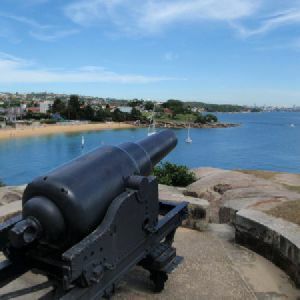 Enjoy views of the entrance to Sydney Harbour, the coastal cliff line and a historic gun emplacement. 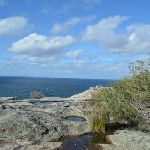 The stunning lookouts provide great views all year round and a popular vantage point for whale watchers. The whales pass by twice annually, heading north in June and July, and again when they return to the Antarctic in August and October. There are about 50 car parking bays. 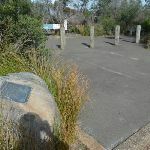 Two are marked mobility parking bays nearest to the start of the walk. 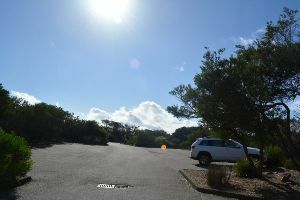 The mobility parking area is asphalt, 4m wide and 6m deep.
. NPWS parking fees apply unless you have a NPWS pass and there are ticket machines available. Timber bollard and gutter ramp pinch points at the start of the walk. The gap between the bollards are 1.2m, and the ramp is 1.27m wide.
. 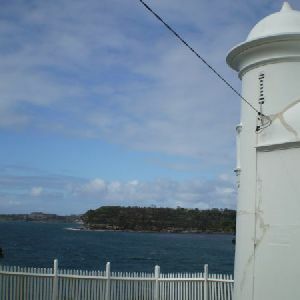 The walk leads past the ‘Welcome to North Head’ information sign, then between the timber bollards to the intersection marked with the metal ‘Fairfax walking track’ sign. A timber slat bench seat, 44cm high, 44cm deep and 1.8m wide with no arm or backrest. (on the left) and leads gently uphill for about 30m to go over a rise then starts heading gently downhill, where the path bends right. About 90m past this bend the path leads to a 3-way intersection above South Pacific (Eastern) Lookout. Turn left: CURRENTLY CLOSED. 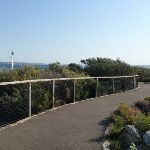 From the intersection, this walk heads directly towards the ocean views along the asphalt path. The path then comes to the top of some steps, where there are great views. 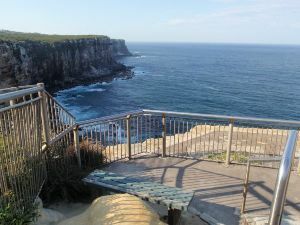 Continue down the stairs to come to the formal fenced lookout and wonderful cliff views. At the end of this side trip, retrace your steps back to the main walk then Turn left. 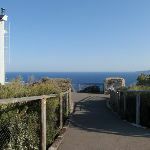 Continue straight: From the intersection near the lookout, this walk follows the main path gently downhill keeping the ocean to the left. 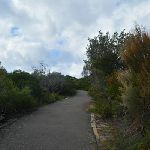 The path provides some nice ocean views over the heath for about 120m until coming to a small concrete building (on the left). 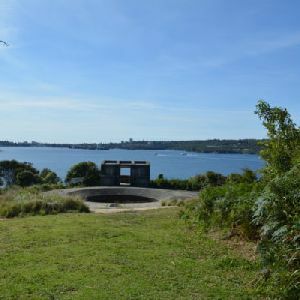 This small concrete building was used as a gunning placement and bunker for those who would keep watch over Sydney Harbour during World War Two. 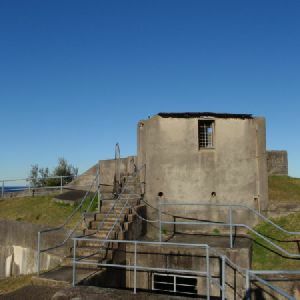 It was built in the 1920s (prior to the war), one of several new fortifications built at the time, the first since federation. Access to the building is via an 82cm wide entry, up two (5cm and 15cm) steps and into a 2.4×2.1m room. 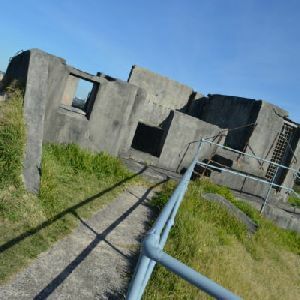 (0.27km) Old Gun Emplacement → North Head (Southern) Lookout int. 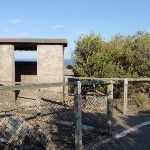 Continue straight: From the concrete building, this walk follows the main footpath gently downhill, keeping the ocean to the left. 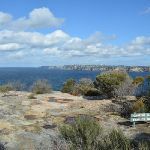 The path winds through the heath for about 60m to come to a 3-way intersection near the North Head (Southern) Lookout (on the left). 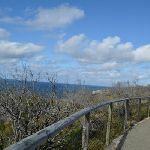 Continue straight: From the intersection, this walk heads gently downhill along the 10m path towards the ocean to the fenced lookout. At the end of this side trip, retrace your steps back to the main walk then Turn left. 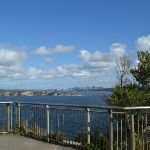 This lookout is on the southern edge of North Head and provides a great view that spans from Sydney city in the distance (to the south), around the South Pacific Ocean (to the east). 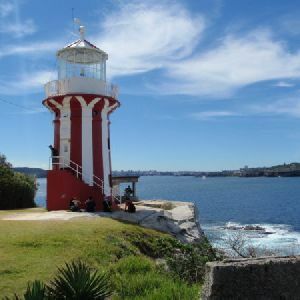 You will notice a large white pole with a green light, which helps ships navigate and avoid the headland as they sail into Sydney Harbour. 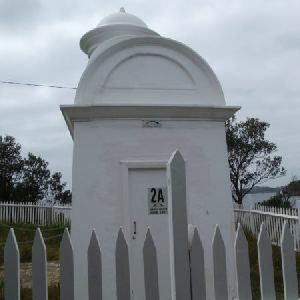 The lookout has a 1.18m high fence/railing around the edge. 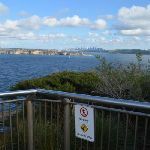 In 2017 part of this lookout was closed and fenced off due to cliff instability, you can still enjoy the view from behind the fence. 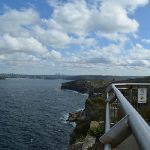 Turn right: From the intersection near North Head (Southern) Lookout, this walk follows the main footpath gently downhill keeping the fence and ocean to the left. 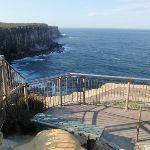 The path leads beside a section of nearly bald cliff top opening up wide ocean views for nearly 150m to come to a 3-way intersection (with the steps on track on the left). 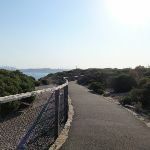 Continue straight: From the intersection, this walk follows the footpath distinctly uphill, initially keeping the ocean (and step track) to the left. 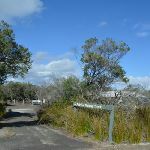 The path leads up the slope for 30m to come to a large 3-way intersection marked with a ‘Fairfax Lookout’ plaque (on the left). 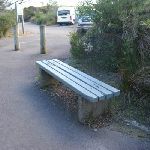 A timber slat bench seat, 47cm high, 30cm deep and 2m wide with a 39cm high backrest. A timber slat bench seat, 48cm high, 30cm deep and 2m wide with a 41cm high backrest. ). At the end of this side trip, retrace your steps back to the main walk then Veer left. at the upper and lower viewing areas. 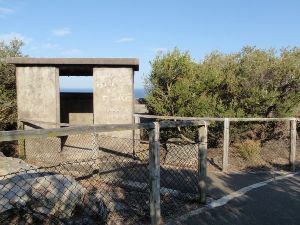 The lookout has a 1.2m high metal fence along the edge. 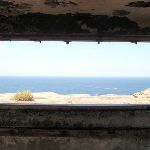 A small section of the lower lookout was closed in 2017 due to cliff instability. 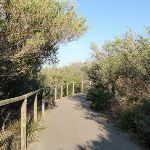 Veer right: From the intersection, this walk heads gently uphill along the footpath keeping the timber fence to the left. The path winds gently uphill for just shy of 120m to come to an intersection with a dirt trail (on the left). A timber slat bench seat, 47cm high, 45cm deep and 1.8m wide with no arm or backrest. 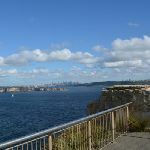 to the pedestrian crossing at the North Head Scenic Drive car park. Seats: There are 2 places to sit on this walk. They are 740m apart. This whole walk, 760m is flat with no steps. This whole walk, 760m follows a smooth and hardened path. This whole walk, 760m is clearly signposted. This whole walk, 760m requires no previous bushwalking experience. 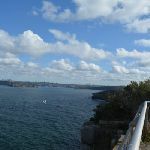 This whole walk, 760m is close to useful facilities (such as fenced cliffs and seats). 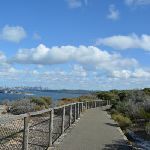 A list of walks that share part of the track with the Fairfax Walk walk. 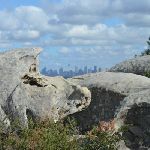 A list of walks that start near the Fairfax Walk walk. 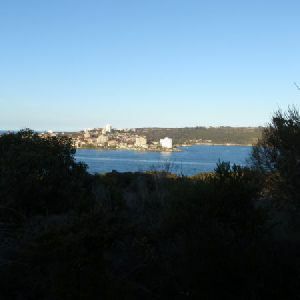 This short and easy walk leads from Tania Park to wonderful views of Arabanoo Lookout. 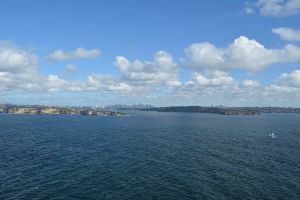 The views over North Head and the water are wonderful. 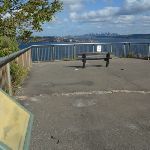 There is a concrete path leading the whole way and two seats at the top waiting for you to soak up the views. Tania Park can get busy on weekends with sport and walkers. A lovely walk if you are in the area. There are toilets, picnic area and playground at the far end of the Oval. 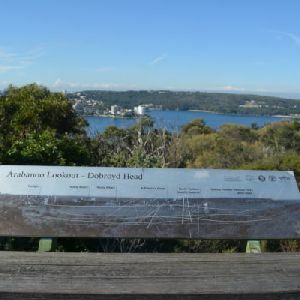 Walking around Dobroyd Head is a fantastic experience. 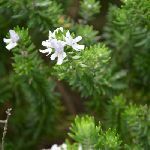 The heath vegetation high up on the walk provides many opportunities to view flowers and insects close up, whilst still enjoying plenty of views out to the sea. 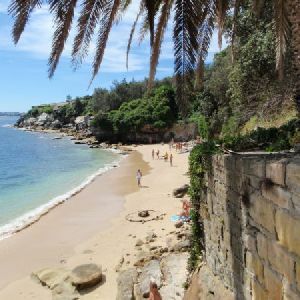 Reef Beach is a great place to stop for a snack or lunch and to get the feet wet before heading back to the road. 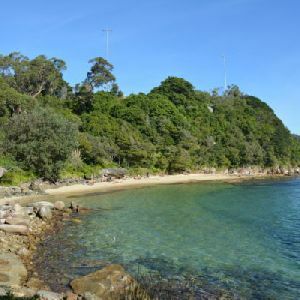 This return walk out to Grotto Point is in a magnificent area above the entrance to Middle Harbour. 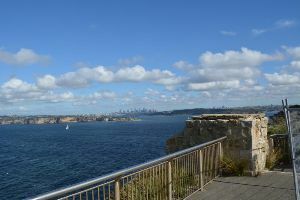 The walk provides plenty of views of Middle Head and over Sydney Harbour to the CBD. 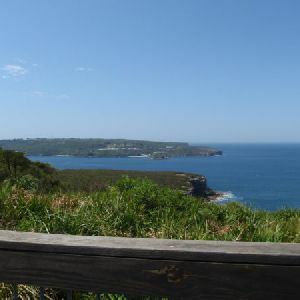 Many scenic views and some spectacular bushland, so close to the city, makes this walk a gem. 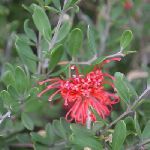 http://new.wildwalks.com/wildwalks_custom/includes/walk_fire_danger.php?walkid=nsw-shnp-fwnh Each park may have its own fire ban, this rating is only valid for today and is based on information from the RFS Please check the RFS Website for more information.